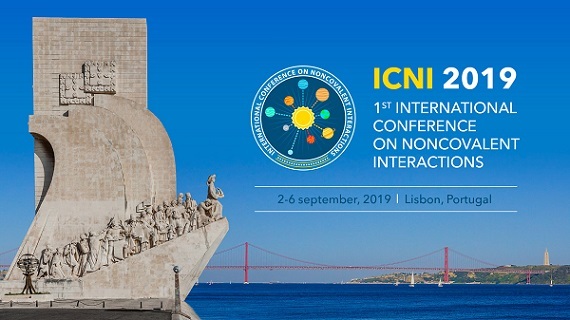 The chemistry of this century is expected to be largely driven by noncovalent interactions and it is timely to establish a general/regular series of International Conferences on Noncovalent Interactions (ICNI), the first one to be held on 2-6 September 2019 in Lisbon. The scientific level of the conference will be provided by its attendants and thus you are cordially invited to present your best and recent scientific work orally, by poster or by poster with a flash oral presentation. Not only the senior researchers are welcome, but also the younger ones, encouraging the exchange of ideas among different generations. The conference aims to highlight the role of Noncovalent Interactions in Synthesis, Catalysis, Crystal engineering, Molecular recognition, Medicinal chemistry, Biology, Materials science, Electrochemical imobilization, etc. including also Theoretical aspects. All approaches will be considered, from fundamental to applied ones, including discussion of new types of noncovalent interactions (aerogen, halogen, chalcogen, pnicogen, tetrel and icosagen bonds) and multidisciplinary studies. The Conference venue is in a privileged position concerning travel requirements. Lisbon is easily reachable from any place of the world, the airport and the main train stations are located inside the town itself (this is a unique case within the European capitals) and all are well served by metro. The Conference place, at the Universidade de Lisboa campus, is also in the town and with close access to public transportation, including metro. Diverse and convenient accommodation facilities are available close to the venue, including low-cost University residences. Attention will also be paid to the social programme, providing opportunities for mixing, visits to cultural places, excursions to sites of unique natural beauty, and for tasting the typical Portuguese cuisine and feeling the inspiration of our wines! We'll be most pleased to welcome you herein and do hope you will enjoy a pleasant time along all the Conference, from both scientific and social points of view.